The annual Adrian Leftwich Memorial Lecture took place yesterday, with a great lecture by Cornell University professor and leading expert on democratic development, Nic van de Walle. 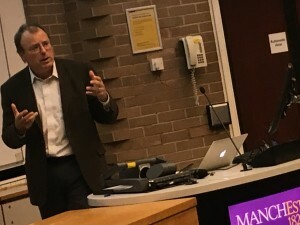 Nic spoke on social coalitions and democratic development in sub-Saharan Africa, with particular reference to Barrington Moore’s landmark book The Social Origins of Dictatorship and Democracy (1966). Watch the lecture below. You can also listen to it here.